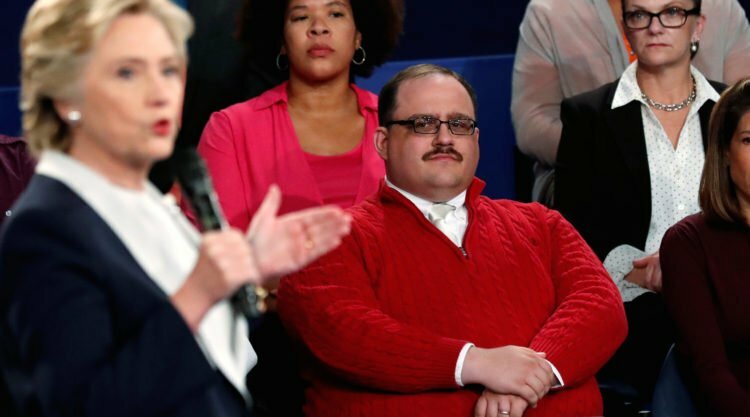 Such cloying desperation… the liberal media could not stop cooing over Ken Bone who came out of nowhere after asking a question during the presidential debate. A giant of a teddy bear stuffed into a read sweater… he became the darling of leftists in an instant. Then they turned on him for supposed thought crimes. All because of an opinion he expressed on Reddit. Bone was one of the undecided voters who originally was for Trump, but was impressed by Clinton. At that point, those like Jake Tapper began a lovefest with him. Tapper gushed over his awesomeness. Warning… this fawning cooing should be viewed on an empty stomach. You’ve been warned. 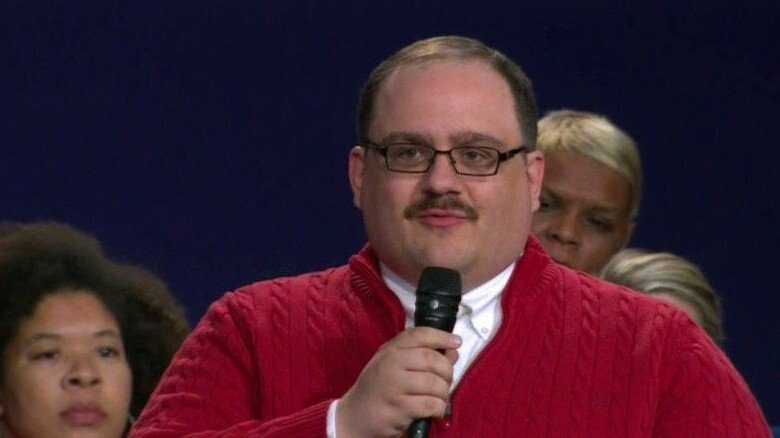 JAKE TAPPER: All day long, my staff and I, we’ve been pondering this important question, “What makes Ken Bone so awesome?” Ken Bone, as you may recall, was the undecided voter in the red sweater who asked the energy question at last night’s debate, why do we all find him so charming? Is it the red sweater? That was actually his backup outfit after he says he split his pants to his olive-cover colored suit. Maybe it’s the mustache? Perhaps it’s the disposable camera he used to snap pics after the debate. Ken Bone’s name started trending online during the debate. Now, Mr. Bone is making the TV interview rounds. He told CNN earlier today about his new following on Twitter. KEN BONE: I went from last night having 7 Twitter followers, 2 of which were my grandmother because she had to remake her account when she forgot her password, to now I have several hundred. Now, I don’t know why they care what I have to say, but I’m glad they’re engage in the political process. TAPPER: He’s even more awesome than ever, just watching that clip. That number is more than 30,000 now, and the Ken Bone memes are everywhere. There’s Ken Bone with the 90s rap group, Bone Thugs-n- Harmony. How about the Ken Bone Halloween costume? Why the love? Because the media thought (especially the New York Times) that even though Bone was an ‘undecided voter’, he was in reality anti-Trump. Originally, Bone thought Clinton showed composure, while Trump interrupted and attacked. That was enough to endear him to the Marxist media. Then the crush was over and reality seemed to trout smack the media who savaged Bone for merely stating the truth: Ken Bone on Reddit claimed the fatal shooting of Trayvon Martin ‘was justified.’ The horror! We can’t have that kind of sanity dripping out there!! Off with his head!!! His thought crime engendered a fall from liberal grace. Welcome back to the fold Ken. You are truly better off among the deplorables than with the elitist, despicable media.